Feeling thirsty after a long night of dusting vampires? Well, Jones Soda has the drink for you. At this weekend’s Comic-Con, the drink company debuted a line of soda centered around characters from Buffy the Vampire Slayer. 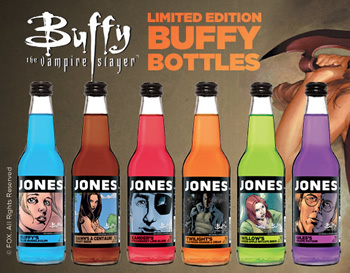 The bottles sport images from the Buffy season eight comic series and the beverages come in six flavors; Buffy’s Blue Bubblegum, Xander’s Strawberry Lime Elixer, Twilight’s Old Moon Orange & Cream, Willow’s Green Apple Witch’s Brew, Giles’s Grape Potion, and Dawn’s a Centaur! Root Bear. The limited edition bottles are available at Comic-Con and can also be ordered from the Jones website. What do you think? Any of the flavors sound like they’d be worth trying — or is this just for die-hard fans?